» Forum » Tech » Tech: Early solid state » Seeking a regret-free way to secure ball guide on Blackout? » Seeking a regret-free way to secure ball guide on Blackout? Seeking a regret-free way to secure ball guide on Blackout? A ball guide on my Blackout keeps popping out when hit by the ball - see the attached picture of what the guide looks like when it is installed. Clearly, pushing it back in isn't solving the problem. I can think of several ways to secure it, but I don't want to do something I will regret later. What is the approved, non-hack way to secure this so it doesn't come loose again? I have a box of wood stick matches. I will shove a match stick down the stripped out wood hole and then break it off flush with the PF. Then the star post goes down. The wood match stick gives your screw something to bite into. Easy, reversible, and regret free. I use the same trick as the match stick, but use toothpicks and wood glue. I dip the toothpick in wood glue, stuff it in the hole, raise the toothpick just a tiny bit, break the toothpick flush, and push it back down the hole. Allow the glue to dry, then screw the post screw back in. Another way is to drill the hole all the way through and use a machine screw and nut combination. Some people swear by this, others swear at it. 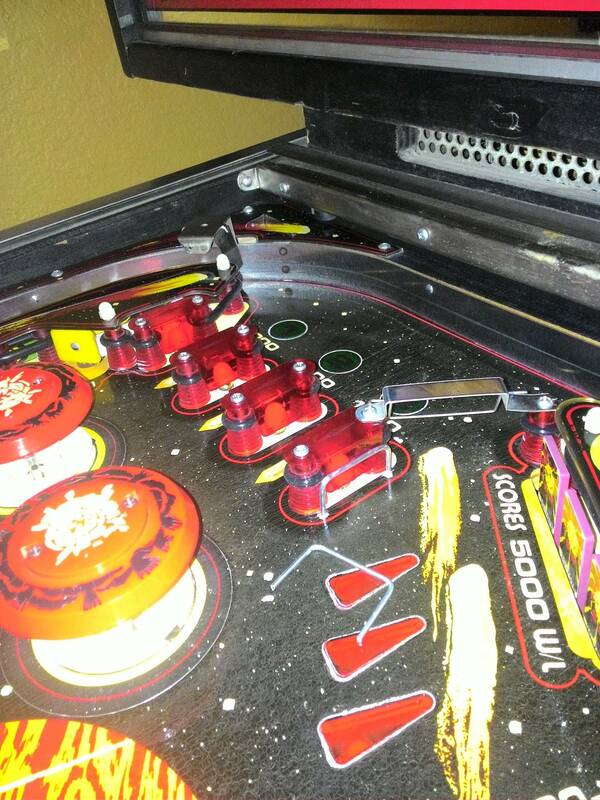 If you do use this method, look on the underside of the playfield before drilling the hole. I have had the same problem before, seems people are thinking its the post and screw, not the wire guide. Cheddar is right, they flatten the end of the wire to get it to grab when they install, but that doesn't help much, and you would have to pull the other end, that is probably OK.
Also, I have seen this situation, where the wire is actually broken at the flattened part, and that piece is still in the PF. That could be the case for you, not sure, but then there is nothing to grab the PF wood. I think a "proper" fix might be to remake the wire, with flattened barbs to grab, possibly with a bigger wire. That is scary though, and may require drilling the hole a little larger. Yikes! Hope to see a better recommendation here. OK - I too, thought you were referring to the post. I have not had a broken wire form, but if it is broken, I think you would have to drive it out. I have had good luck removing the wire form by using a small block of wood as a fulcrum, and put a screwdriver near each bend, pushing down on the screwdriver a small bit at a time. I will warn you, that when the form comes out, it kind of "pops", and will likely carry a bit of paint with it. Once out, you can see whether the wire form is broken. If not broken, then fill the hole with a flat toothpick and glue, then drive it back in. Use a wood softener to drive the form back in, which should be nearly as wide as the wire form itself. (about 2") Softly tap the wire form down so it goes back in evenly. You should be able to feel when it bottoms out. Since the wire form moves, I suspect one end is broken, and the other end is wallowed out, so you will need to fill both holes. Getting the broken piece out will not be for the faint of heart - all I can think of doing is using a finishing nail to drive it out of the bottom, fill the hole with a toothpick, and install a new wire form. Hopefully, others can come up with a better method. Good Luck and let us know what you do. I made a new one out of an aluminum welding rod that was just a couple thousandths thicker , worked like a charm. Have a couple hundred plays on it and it has not bent a bit, I have also used a stainless steel coat hanger on another game. You can fill the hole with 2 part epoxy, allow to cure, then redrill slightly undersized and tap the wire form back in. BTW: make sure the guide it sunk down so that the center of the ball makes contact with the center of the guide. If you leave the guide high, the ball will soon uproot it. As Vid said, make sure the height of the ball guide is correct so that ball does not "pop" it out, better for it to be a bit lower if you are in doubt. But I would disagree with the suggestion of filling the hole and redrilling it after the epoxy cures. 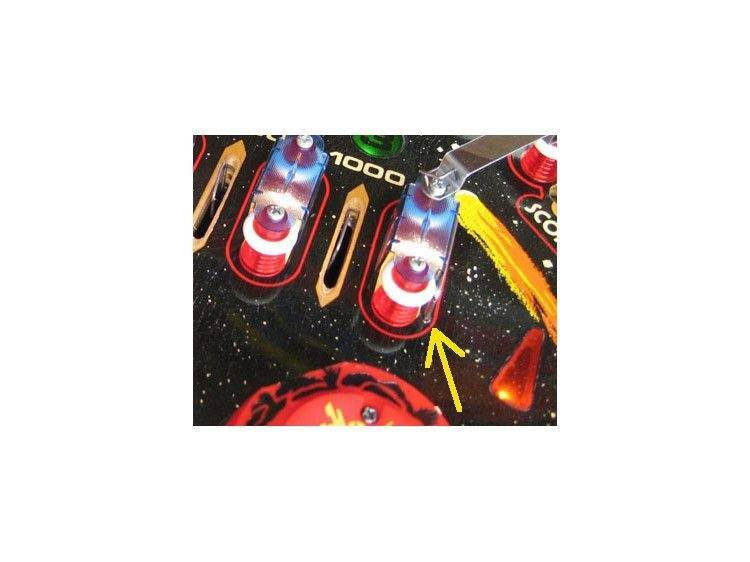 I think doing this will almost guarantee that the drill bit will slip off of the epoxy "plug" that is in the hole and your drill bit will go wander into the much softer wood that makes up the playfield, causing the holes for your ball guide to be in the wrong/different location. When I have had loose guides I have put a good bit of wood glue into the hole and push in the ball guide while the wood glue is still wet. Wipe up any glue that pukes up out of the holes, and some should come up, you want the holes full of glue. Now don't touch the ball guide for at least a day. The glue will not glue the guide into the hole, but it will fill up the extra space in the hole and should keep the ball guide in place. Thanks for the great suggestions. Since the wire form isn't broken I'll try the wood glue first since that seems the least risky. If that fails, I'll go for the 2 part epoxy.